© Copyright 2019 Accent RE Inv. Group All rights reserved. 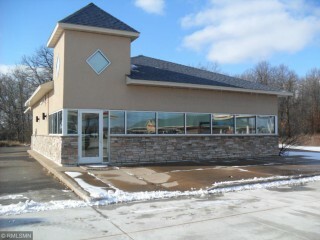 Prime opportunity to purchase a commercial Building in Rush City. Formerly a bank. The main level is outfitted with an open lobby area with tongue and grove ceilings, 2 private offices, Conference room, Break room with kitchenette, Rest Room, teller counter with two exterior drive-thru, Handicap accessible, Fireplace plus much more. This busy location has a high traffic count of 7000 per day. Prime visibility and easy access to Interstate 35. Come take a look!!! The materials contained within this page may not be reproduced without the express written consent of Accent RE Inv. Group. The information herein is believed to be accurate and timely, but no warranty as such is expressed or implied.